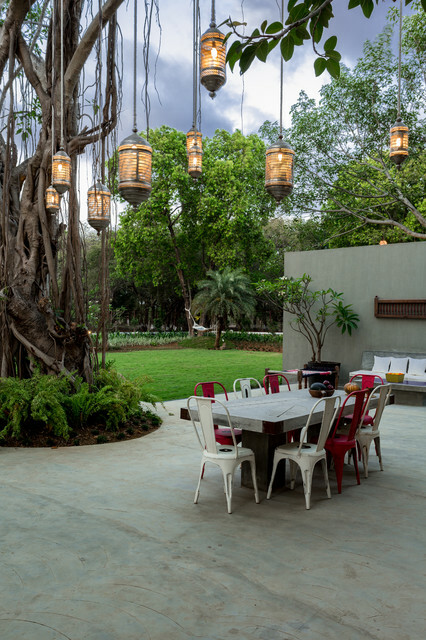 The main deck, flanked by lush green lawns, consists of built-in seating – one rests against the wall embellished with traditional Indian wall art. The other is a dining table built under the expanse of the large banyan tree. “This space is to enjoy the filtered sunlight during the day and soft mood lighting by night,” says Gupta. Sofas, tables, lights: customised by The Orange Lane.Want to see more pictures of this home? Click hereRead more:Houzz Tour: This Outhouse Teases With its Luxury and its OpulenceHouzz Tour: A House of CourtyardsTell us: What was your favourite part of this home? Write in Comments below. 10. There is something special about beautiful lights hanging from a tree and a dining table underneath it. Easy DIY, if you like climbing trees. Use candle-holders of good-quality glass or they may break due to the heat from the tea lights. You can use battery-operated lights instead, if you prefer. If climbing a tree seems too much of an adventure, hang these from its lower branches or from temporary hooks attached to any convenient support nearby. Winner (garden): The Orange LaneThis is a winning outdoor scape ideal for socials where the main deck is flanked by lush green lawns and custom seating – one created against the wall and the other, a dining table built under the expanse of a large banyan tree. Dine in leisure … and style Eating outdoors en famille is most enjoyed while seated around a dining table. It’s easy enough to buy a whole dining set off the shelf, but the fun lies in mixing ’n’ matching. In this Goan patio, industrial-style, distressed metal chairs pair with a solid wooden table. The mix of materials and styles adds an interesting visual and textural element to the space. could I hang lights on the east side of the tree?